Why did the Federal Reserve and its monetary central planners around the world crush the real yield on long-term debt toward zero and below? It’s a simple question. And the answer is as simple as you think it is, too. They say it was for “the economy.” But that’s not what the data suggest. The central purposes were to encourage mortgage borrowing and new and existing home sales on the consumer side and to boost long-term borrowing and capital expenditures (CAPEX) by the business sector. Except neither kind of Main Street stimulus really happened. The Fed’s “quantitative easing” program and “zero interest rate” policy was predicated on the putative elixir of more debt. Benighted consumers hadn’t borrowed enough. Short-sighted bankers hadn’t lent enough. That’s not economic enlightenment. It’s archaic Keynesian catechism. And it’s been proved for decades now that more debt relative to income leads to slower economic growth. Indeed, the 10-year trend rate of real U.S. economic growth dropped from 3.5% in 1970 to 1.5% in 2018. At the same time, the aggregate leverage ratio of the U.S. economy soared from 1.5 times to 3.5 times. 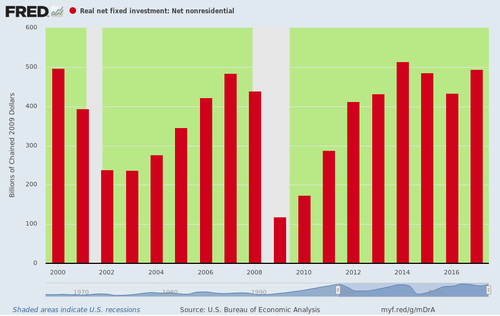 Let’s talk about what happened after the Fed-blown boom and bust in the U.S. housing sector. The most massive monetary stimulus in history and the lowest real mortgage rates ever couldn’t get Humpty Dumpty back together and up on the high wall of speculative mania. 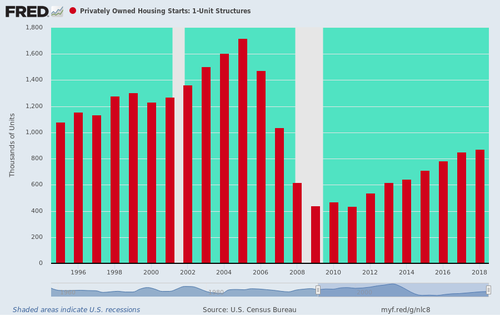 In fact, single-family housing starts have already plateaued for this cycle – far below the 1995 starting point for the housing boom that carried into the 21st century. 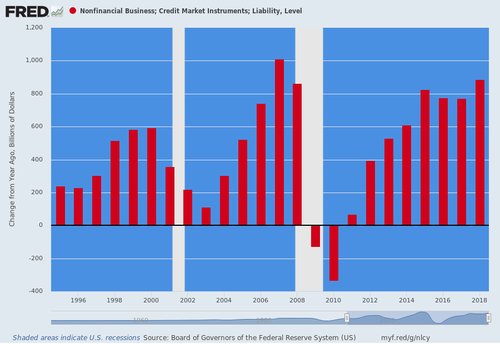 The Fed’s radical interest-rate repression did induce the business sector – corporate and non-corporate – to borrow like hell. Business debt surged from just under $10 trillion in 2007 to $15 trillion today. During the last four years, new debt has been issued at a rate of $800 billion per year. It was only ever faster in 2007, right before the Global Financial Crisis. None of this borrowing went was invested in productive new plant, equipment, technology, intellectual property, and/or labor. Net real business capital expenditures (CAPEX) after depreciation is still below its turn-of-the-century level. “Easy money” did nothing to boost efficiency and output of the real economy. It fueled a massive burst of financial engineering on borrowed money. 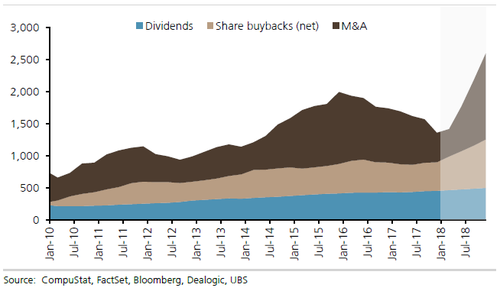 During 2018 alone, components of the S&P 500 Index spent more than $2.5 trillion on buybacks, dividends, and M&A. That’s more than three times what they spent on CAPEX. Perhaps “quantitative easing” did stimulate borrowing in the business sector. But it was perverted, and the stimulus only fed Wall Street’s speculative mania. Both the fiscal and monetary authorities in Imperial Washington are about a single purpose: to inflate the price of financial assets, knowingly and wittingly or otherwise, on behalf of the top 1% and top 10% of households that hold 40% and 85% of risk assets, respectively. Not even the Donald’s and the GOP’s corporate rate cut – financed with Uncle Sam’s credit card – piled on top of the Fed’s radical rate compression generated a surge the production of business equipment by U.S. suppliers. As of February, production was still below levels reached in November 2014. And it’s barely above the pre-crisis peak reached way back in December 2007. The Fed didn’t end its “normalization” campaign for fear of a negative impact on the economy; there hasn’t been any positive impact on Main Street for the past decade. This is all about appeasing traders, speculators, and grifters. It’s pathetic. And it’s laying the foundation for the populist Left and its platform of unadulterated redistributionism.